Kim Warren takes a look at rivalry and identifies three types of rivalry that can be used, alone or in combination, to deal with competition between firms and within an industry. Firms face a constant challenge to understand and manage competition over time: what to do when and how much, for how long and with what expected effect. In this battle, managers use resources they already have to develop the further resources they need, faster and more sustainably than their competitors. Each of these applies not only to customers, but also to other assets that must be won against rivals. In complex industries, interactions between many competitors can be simplified by grouping firms together, and industry evolution and scenarios for the future can be evaluated using extensions of this approach. 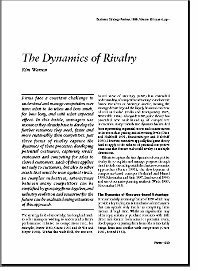 The Dynamics of Rivalry details the frameworks that explain how competition plays out over time, and shows how they can be used to build competitive advantage for the future.